Hotel Happy Home - The Lake Paradise is adorned in the aesthetic beauty of Nainital. The hotel showcases state of the art amenities and modern technology. The aura of the emerald lakes surrounding the hotel makes it an ideal retreat for honeymoon couples. 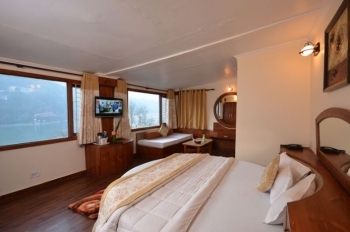 One can admire a panoramic view of the Nainital lake and the natural environs from the large bay windows of the rooms. When the sunrays falls on the crystal clear water of the lakes it appears as if several divas are carelessly floating by. Hotel Happy Home - The Lake Paradise Nainital has another sister hotel in Haldwani, named as Hotel Happy Home Haldwani. The hotel is located on Mall Road opposite the Naini Lake. The hotel is easily accessible as it is located at a walking distance of 300 metres from the taxi stand and bus terminal. The hotel has been recently furnished with modern amenities to provide a luxurious stay to the guests. The hotel houses (34) wooden accentric rooms which possess a modern decor. The stately rooms are classified as Deluxe Room, Deluxe Lake View, Family Suite and Executive Suite. The spacious room features an attach bathroom, hot/cold running water, bathroom toiletries, intercom facility and 32 LED with cable network. The hotel possess two fine dining restaurants called Woods and Modern Buffet Hall. The Woods serves authentic Indian, Chinese, Continental and Gujrati cuisines. The Modern Buffet Hall serves an array of savor cuisines which are rich in flavours. One can have an extravagant dinner with their loved ones at the Modern Buffet Hall or the Woods. - Peak Season : May 1st - July 15th, Dec 16th - Jan 5th, All Festive and National Holidays during the year. 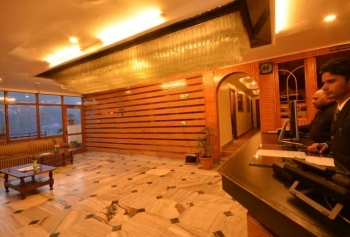 The hotel is situated on Mall Road opposite Naini Lake in Nainital. Nainital is well connected by motorable roads with major destinations of India. Buses to Nainital are easily available from ISBT Anand Vihar. The distance between Delhi to Nainital is approximately 07 hour drive. Taxi and buses are available from major destinations of Garhwal and Kumaon region. Kathgodam railway station is the nearest rail head to Nainital at a distance of 41 km. It is well connected by metalled roads with major destinations of India like Lucknow, Delhi and Kolkata. Trains run ar regular intervals to Kathgodam. Nainital is only 41 km away from Kathgodam railway staion which is merely an hour drive. Pantnagar Civil Aerodrome is the nearest airport to Nainital. It is situated about 72 km from Nainital and is well connected by motorable roads. Taxis are easily available from Pantnagar airport. Indira Gandhi International Airport at New Delhi is the nearest international airport about 300 km away.